Named after a favorite apple festival in Wisconsin, Bayfield wraps the shoulders in delicate scalloped lace. 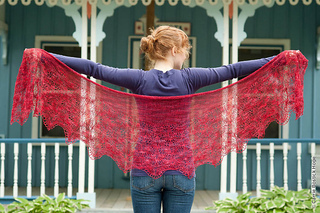 Bayfield is a crescent shaped shawl worked from the outer edge to the center back neck. 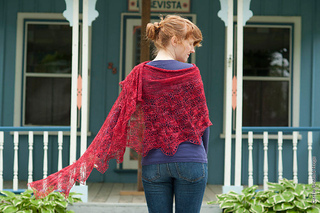 The crescent shape is created with a combination of decreases and short rows. 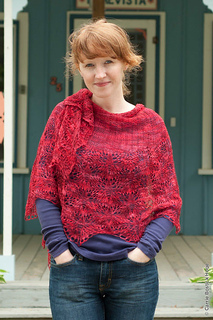 The shawl features an unusual crochet picot cast on and a crochet chain bind off. 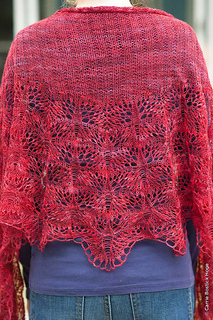 Lace pattern is given in both chart form and row-by-row instructions. I do block my shawls severely, such that they are stretched until they cannot be stretched any more. Shawls worked in non-stretchy yarns (i.e. yarns with a high silk, alpaca or bamboo content) will hold this super stretched state. Shawls worked in more springy yarns (i.e. yarns with high twist, or high wool content) will stretch out while blocking, but then relax back into their original comfort zone and so do not retain their blocked size. If you are substituting a springy yarn make sure that you keep this in mind as you swatch, and let your blocked swatch rest before checking your gauge. 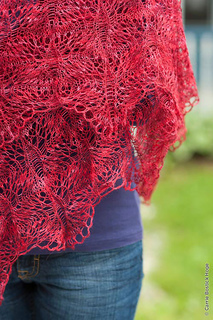 This will help ensure that your finished shawl will meet your expectations.